Nice addition to farmhouse modern kitchen. Undercoated and padded with SoundAbsorb technology to minimize the echoes of water flow, the 16-gauge, 304 series VIGO 30 inches Bedford Stainless Steel Farmhouse Kitchen Sink with satin finish is ideal for your modern kitchen. The 30 inches apron front farmhouse sink is over 9 inches deep, perfect for accommodating large pots and pans. This set features a protective sink grid and matching drain strainer. Dimensions 30.0 In. X 22.25 In. X 9.88 In. 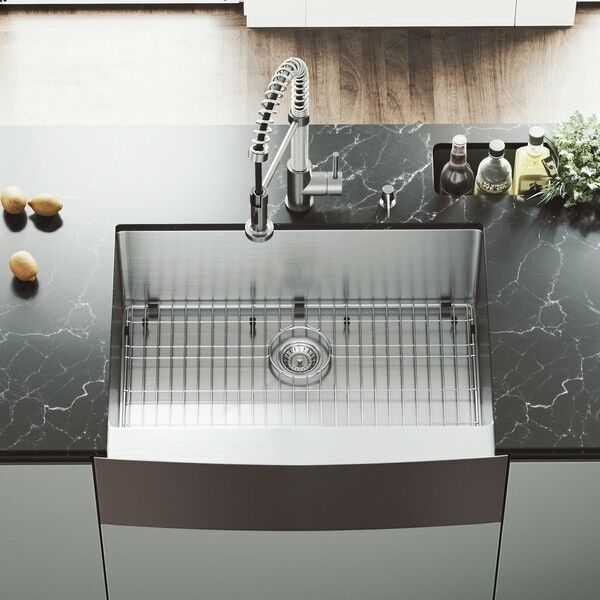 Love this Vigo sink. It is huge! Has a great modern feel to a farmhouse style sink. Love how the sink is lined, so it doesn't make any "pinging" sounds when metal dishes are dropped in. And the garbage disposal is quite muffled as well. Great sink. My highly experienced installer said he wished his own sink were older, so he'd have a reason to replace it with one just like this. The capacity is enormous and the style extremely attractive, sleek and perfect with stainless appliances. Best of all is the quality. 16-gauge stainless is hard to find, especially in this price range, and the sink is made in pieces and painstakingly welded/polished instead of being stamped out of a single piece. It's remarkably heavy and well insulated. I could not be happier with the look nor quality. Great finish and style, perfect for the transitional kitchen in our basement. Love the grid that protects the sink basin too! The sink is solid and sturdy and looks and feels like quality. It installed easy. I have not had the chance to use it yet because the kitchen is still being finished, but the look of this sink changed the entire look of the kitchen. Nice sink. Seems high quality. It's great that it comes with a strainer and grid to reduce stratches.. we didn't use strainer because we installed a garbage disposal and those come with flanges. Very pleased with this purchase. The grid, strainer, and cutting board work great! I've had my sink for over two years now and I am still getting compliments on it. It's beautiful, sturdy, large enough to handle everything and did I say, beautiful. A perfect purchase for my new kitchen. I definitely recommend to others. "Can this sink be installed as an "undermount sink"?" Hello LisaA, VIGO farmhouse sinks can be installed undermount, flush, or above counter. Thanks for shopping with us! Been looking for a farmhouse sink for a reno, but didn't want to pay a mint. "Why does this say it's a top mount?" Thank you for your question, ltspringer. The VIGO 30-inch Farmhouse Stainless Steel Kitchen Sink, Grid and Strainer is referred to as a Topmount, because it is installed on top of the counter top and is the more traditional way to install a sink. Have a great day.